My Results From Calling Out Verbal Abuse (Yours May Vary)Naming the type of abuse out loud escalated the abuse to the point that he was a raging bull at all times. We COULDN’T talk. I hated having to give up whatever I was doing to leave the room, and a lot of the time he followed me. We played a sick “follow the leader” game around the house with him shouting as I tried to find refuge (and continued naming the type of abuse). 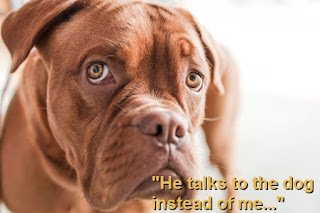 Naming the abuse can do several things, 1. show you, as it did Hollie, that your partner has no intention of changing, 2. escalate the abuse, especially if you call attentiont to abuse in a confrontational way, 3. or allow your partner to become more aware of he or she is doing. Some abusive partners truly don't realize the extent of their behvaior--and remember, we often have trained them it is OK to mistreat us. In these cases a low key approach to calling attention, often without words, can benefit change in the relationship. However, if you are with a hard-core verbal abuser, a real control freak who is very afraid of losing control, you might experience some of the same things Hollie did. She put a list of the abuse up on the refrigerator. Coming across judgemental and accusatory to any partner probably will have a simelar outcome. When I began my path to having my husband repsect me, I called attention to his abuse by whipping out a tape recorder every time he started in on me. It dramatically changed his behavior right away. So even if you don't think they know what they are doing, at some level they do know or their behavior wouldn't improve when they think others might hear. There are other ways to call attention to the abuse in a non-threatening way...if any of you have ways to do it, things you have used sucessfully, please share..